Been a couple of weeks since we last checked in so time for a quick update. Summers hols have now begun (even the sun has put in a brief appearance) which leaves us with the annual juggle of looking after our kids and trying to bang beats out all day. This normally leaves us with 6 weeks of guilt for working long hours in the studio and imposing children on Granny, when we feel we should take the whole 6 weeks off and do bike rides, picnics, tree houses and other self-imposed famous five-type activities. On the flip side working from home (well MR Hoodees) does mean we see more of our kids day to day than most full time working parents, but the summer holiday guilt still stings a bit, but gotta earn a dollar I guess. 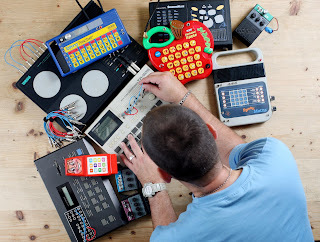 On the work front we're putting together a chilled out beats download pack for our friends at Sample Magic, and have just finished rincing our (and any available mates) sizable digital drum machine collection for another drum hits pack for DMS. The monthly work also carrys on, so we've commissions to start on for both FM and CM, which we'll blog about (with vids) if we get time - got to fit a couple of weeks away with the family in Aug as well! Kinda sums up the normal audio nuttiness of working around here rather well. With the added bonus of having to gaffer-tape Eckie to the ceiling to take the shot.